Sets built by Derek Allan, Stan Moss, Jim Moffatt, Bob Montgomery, and Harry Turkington. But before I show you my woodland scene. Do you believe in Fairies? Sometimes you see them - and the next minute they're gone. The Woods. 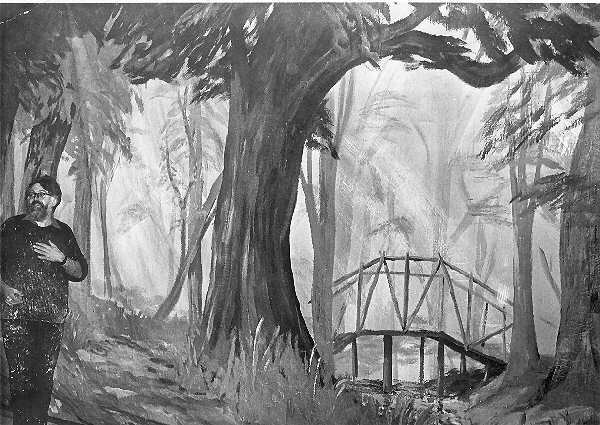 Black and white photo of the backcloth, with one of my recurring elements of a bridge over a stream. The background with the streaming light rays and vague tree silhouettes was painted first (wet-in-wet), then the foreground elements were built up from the back to the front.